An administrative area, division, or district. Statoil is stepping up its Arctic activities and will drill nine wells during a non-stop 2013 Norwegian Barents exploration campaign. The company plans to meet development challenges here by tripling its Arctic technology research budget. Statoil’s exploration experience in the Barents is already extensive. Of the 94 exploration wells drilled in the Norwegian Barents Sea so far, Statoil has been involved in 89. Nine more Statoil-operated wells are on their way here next year. 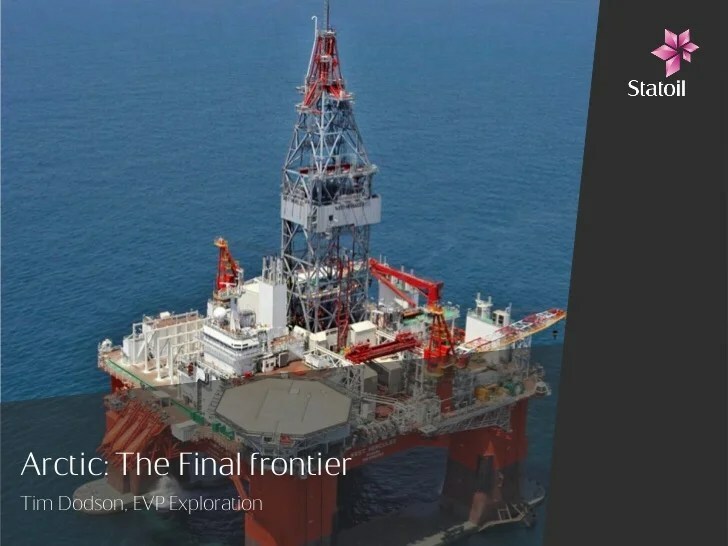 “After our Skrugard and Havis discoveries we still see attractive opportunities here,” says Statoil Exploration executive vice president Tim Dodson. Statoil will start drilling in Nunatak in the Skrugard area in December, and will drill and complete four wells in this area over a six-month period. “These wells are time critical, as any additional resources will make the Skrugard development even more robust,” says Dodson. The campaign will then continue with the drilling of two-three wells in the Hoop frontier exploration area further north in the Barents in the summer of 2013. These will be the northernmost wells ever drilled in Norway. The 2013 Barents drilling campaign finishes in the most mature province of the Barents: the Hammerfest basin. Statoil will carry out growth exploration close to the existing Snøhvit and Goliat discoveries here. In addition to increasing its drilling activities, Statoil has created a technology road map to prepare for activities in even harsher Arctic areas. Some of the technology highlights include work to allow for cost-effective 3D seismic for exploration prospect evaluation in ice, and the continuing development of a tailor-made, Arctic drill unit. The work on the future drilling unit is based on Statoil’s experience with developing specialised category rigs for the Norwegian continental shelf (NCS). The unit will be one that can operate in a wide range of water depths across the Arctic, and will involve integrated operations in drifting ice. Functions here are to include a management system to reduce ice impact, an optimised drilling package for faster drilling and increased rig availability, and solutions to ensure that the rig maintains its position. At present no robust solution for dynamic positioning dedicated for ice operation exists. “When we see a technology need, we try to fill the gap ourselves. We have now directed our strategic focus towards developing technology for exploration and production in ice. A new dedicated unit has been established to solve these challenges,” says Statoil Technology, Projects and Drilling executive vice president Margareth Øvrum. “We’ve secured a five-year contract for Seadrill‘s West Hercules drilling rig. The rig is currently being prepared for Arctic conditions, and can be used to drill consecutively in the region for years to come,” Dodson says. Broad exploration experience in the Barents Sea and available rig capacity make Statoil well prepared for the 22nd licence round on the NCS. Applications are due in early December, while the awarding of new licences will take place in spring 2013. Seventy-two blocks in the Barents will be on offer. “The Skrugard discovery has reignited interest in the Barents. A number of major companies that had left the area will be looking to make their way back in. The competition will be fierce, but we’ve built up a strong track record here, and our application will reflect this,” Dodson says. (Reuters) – China‘s top military newspaper warned the United States on Saturday that U.S.-Philippine military exercises have fanned risks of armed confrontation over the disputed South China Sea. The commentary in China’s Liberation Army Daily falls short of a formal government statement, but marks the harshest high-level warning yet from Beijing about tensions with the Philippines over disputed seas where both countries have recently sent ships to assert their claims. This week American and Filipino troops launched a fortnight of annual naval drills amid the stand-off between Beijing and Manila, who have accused each other of encroaching on sovereign seas near the Scarborough Shoal, west of a former U.S. navy base at Subic Bay. The joint exercises are held in different seas around the Philippines; the leg that takes place in the South China Sea area starts on Monday. “Anyone with clear eyes saw long ago that behind these drills is reflected a mentality that will lead the South China Sea issue down a fork in the road towards military confrontation and resolution through armed force,” said the commentary in the Chinese paper, which is the chief mouthpiece of the People’s Liberation Army. Up to now, China has chided the Philippines over the dispute about the uninhabited shoal known in the Philippines as the Panatag Shoal and which China calls Huangyan, about 124 nautical miles off the main Philippine island of Luzon. 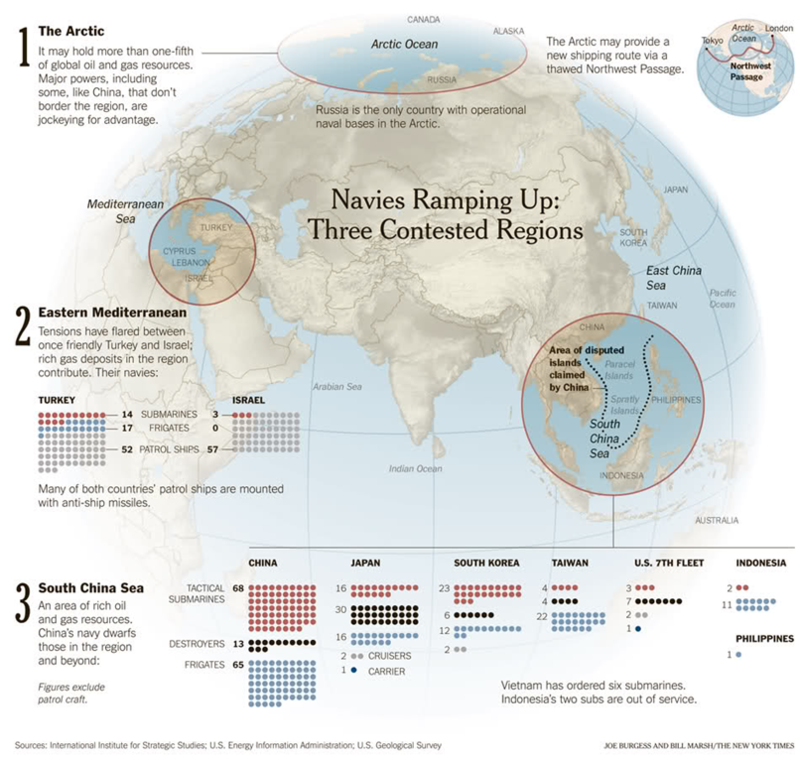 China has territorial disputes with the Philippines, Vietnam, Brunei, Malaysia and Taiwan in the South China Sea, which could be rich in oil and gas and is spanned by busy shipping lanes. Beijing has sought to resolve the disputes one-on-one but there is worry among its neighbors over what some see as growing Chinese assertiveness in staking claims over the seas and various islands, reefs and shoals. In past patches of regional tension over disputed seas, hawkish Chinese military voices have also emerged, only to be later reined in by the government, and the same could be true this time. Since late 2010, China has sought to cool tensions with the United States over regional disputes, trade and currency policies, human rights and other contentious issues. Especially with the ruling Chinese Party preoccupied with a leadership succession late in 2012, Beijing has stressed its hopes for steady relations throughout this year. Nonetheless, experts have said that China remains wary of U.S. military intentions across the Asia-Pacific, especially in the wake of the Obama administration’s vows to “pivot” to the region, reinvigorating diplomatic and security ties with allies. The Liberation Army Daily commentary echoed that wariness. “The U.S. strategy of returning to the Asia-Pacific carries the implication of a shift in military focus, and there is no better strategic opening than China’s sovereignty disputes with the Philippines and other countries in the South China Sea,” said the newspaper. “The United States’ intention of trying to draw more countries into stirring up the situation in the South China Sea is being brandished to the full,” it said.